The Four Corners of Bathurst and Bloor community charette, hosted by Councillors Layton and Vaughan, October 5, 2013, 1 to 4PM at Central Technical School. | Image credit bottom left photo: City of Toronto Archives, Fonds 1231, item 1043, April 3, 1911; all others West Annex News. 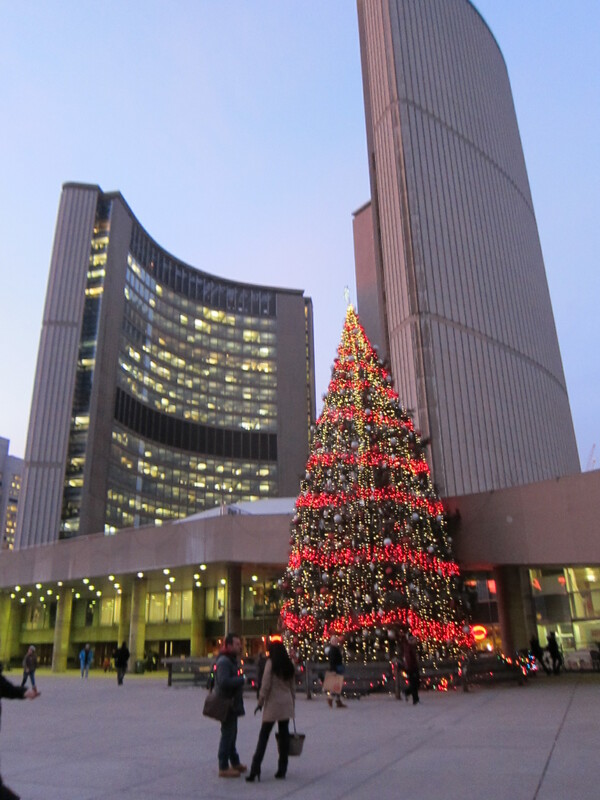 By West Annex News | Here’s what’s happening this week in and around the neighbourhood. Really Really Free Night Market at Dovercourt Park, 155 Bartlett Ave, near Dufferin and Hallam, a social market where everyone is welcome to contribute to the market, and anyone can take something away. 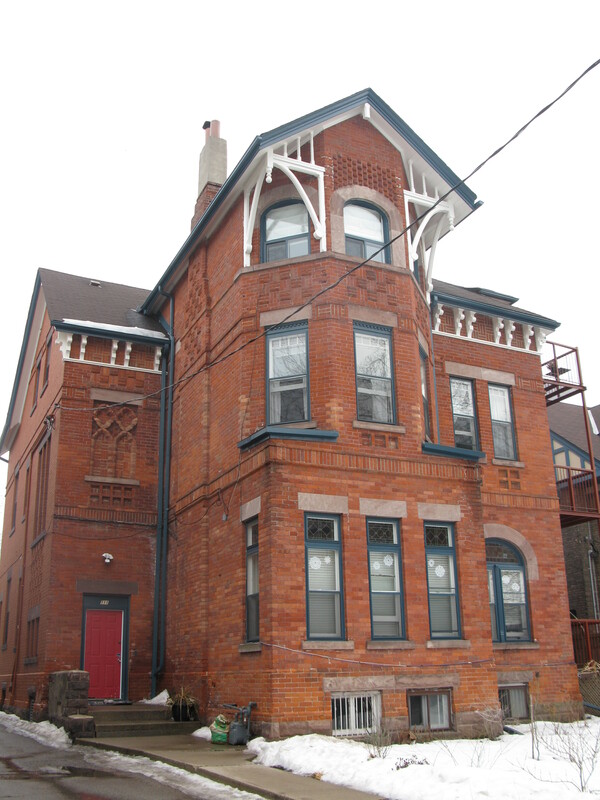 Convergence North at Spadina House, 285 Spadina Road. An array of interactive light sculpture installations along a path created through the five-acre grounds of the Spadina Museum. Nothing is Better at the Church of the Redeemer, 162 Bloor Street West. Synchronized multi-screen video, music, sound, live performance. A thought-provoking and amusing science musical documentary and allegorical journey from the city’s outskirts to its heart of darkness. The Illusion of Linear Time at the Four Seasons Hotel Toronto, 21 Avenue Road. An organic futuristic presentation involving nearly 400 lbs of poured transparent plastic saturated with nearly a mile (4,000 feet) of fibre optic tails. Art meets Chess at Wychwood Barns, Chess pieces created by artist Blandford Gates out of recycled metal will be re used to recreate the Game of the Century, game 5 in the match between Bobby Fischer and Boris Spassky in Reykjavik, Iceland in 1972. See video below to learn more. The Pottery and Glass Show at Artscape Wychwood Barns, Saturday and Sunday, October 5 & 6, 2013, 8AM to 5PM: This juried show and sale showcases the best of Ontario’s glass and clay artists. Admission is free. For the architourist, Eden Smith’s own house is for sale for $1,169,000. 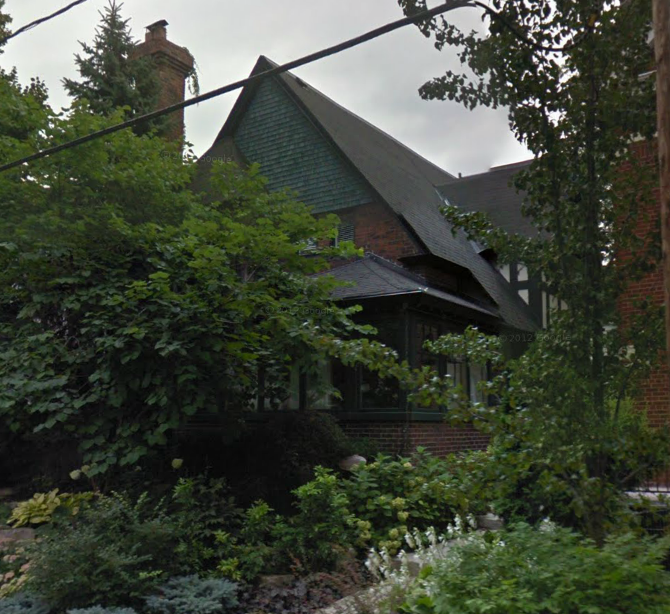 The Century 21 listing says the c. 1896 home at 267 Indian Road home was the prototype for Smith’s Art & Crafts/English Cottage style. [Built Heritage News]. Anthony Rose’s Big Crow (in the back of 176 Dupont Street, the former People’s Foods) is opening for brunch on weekends starting October 5th. Brunch hours are 11AM to 3PM, Saturday and Sunday. The brunch menu is here. The west field of Sibelius Square is closed yet again for soil de-compacting and re-sodding. 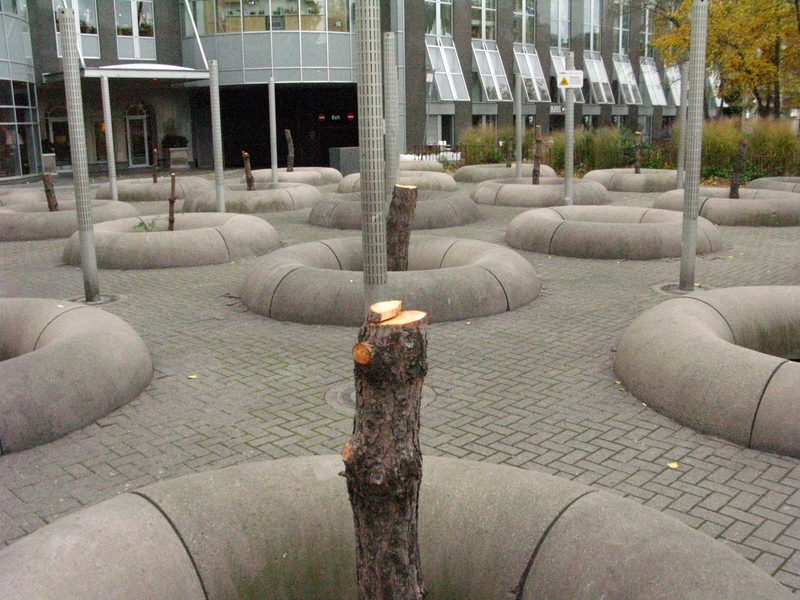 The playing field at Sibelius Square is out of commission. Again. The $1 million plus park renovation in 2012 made the field’s drainage problem worse, not better. 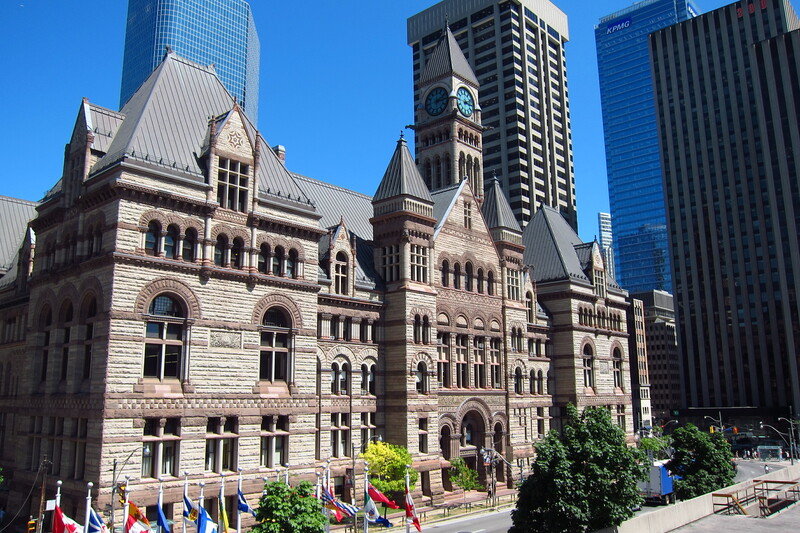 Councillor Vaughan’s constituency assistant Areej Hasso reports that city staff is blaming soil compaction, not a design flaw. Staff says they de-compacted the soil before laying new sod on October 3rd. No word on when play can resume on the field. 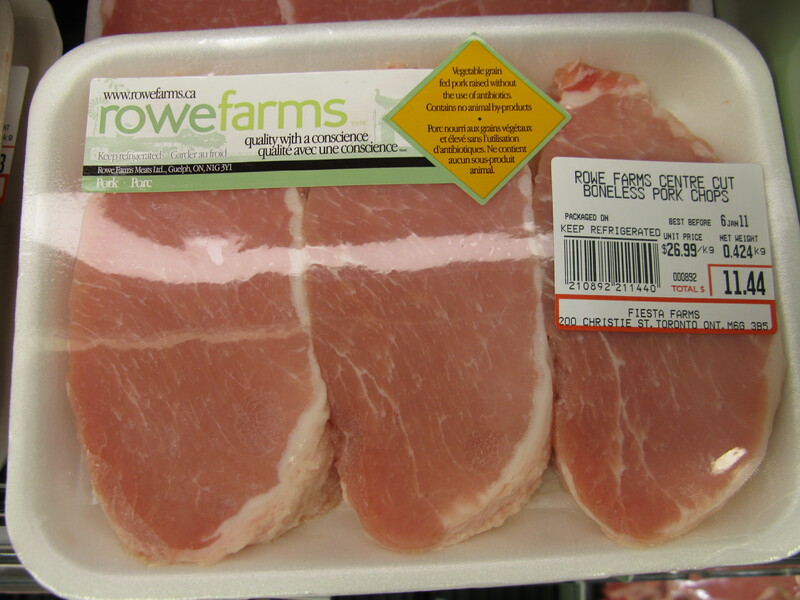 The wrap for June 9, 2012 | Goodbye People’s Foods, hello Famoso Pizzeria and Barton Snacks . . . 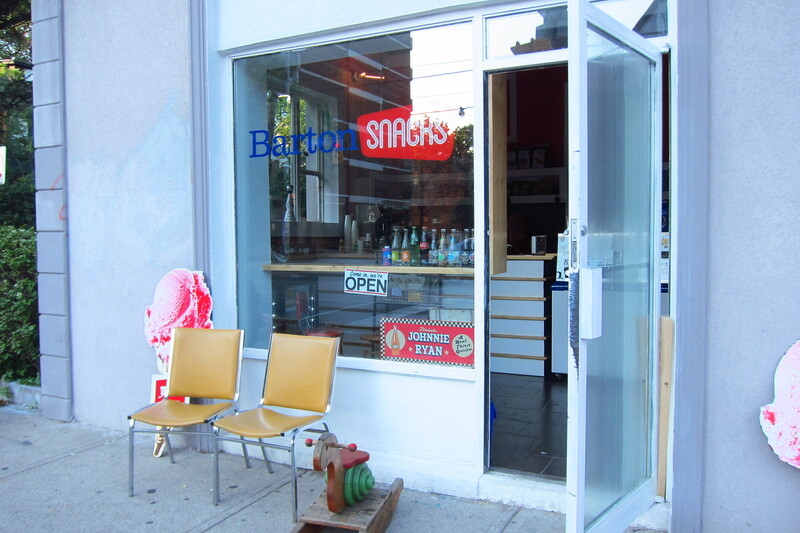 The charming Barton Snacks at the south east corner of Bathurst and Barton, one block north of Bloor. Finally, somewhere to get indie coffee after 6PM in the Annex. New additions to the deadpool: After 50 years, Annex diner People’s Food is folding due to a rent increase [blogTO], while Kromer Radio is closing after 55 years in business. While Kromer told The Grid they’re closing just because they’re tired, an application for a height and usage variance by the new land-owners RioCan suggests that development pressures were the real culprit. 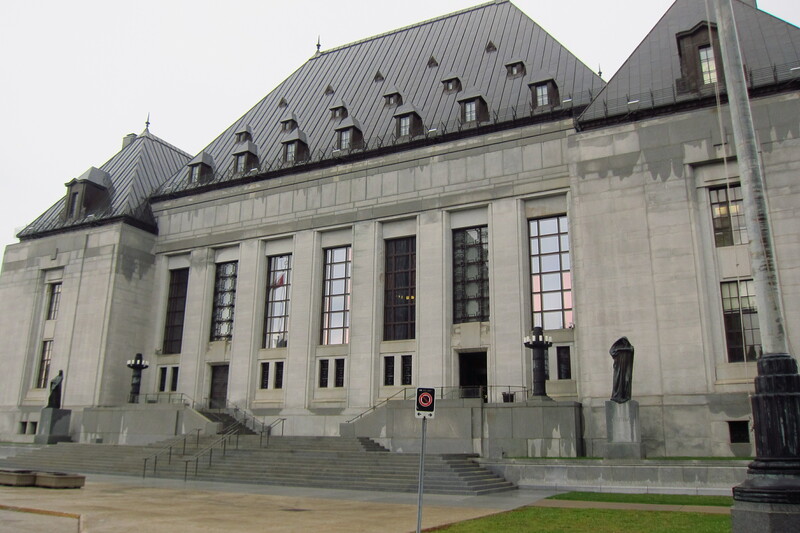 Openfile reports that RioCan’s application was turned down by the Committee of Adjustments, but the developer is expected to appeal to the Ontario Municipal Board. 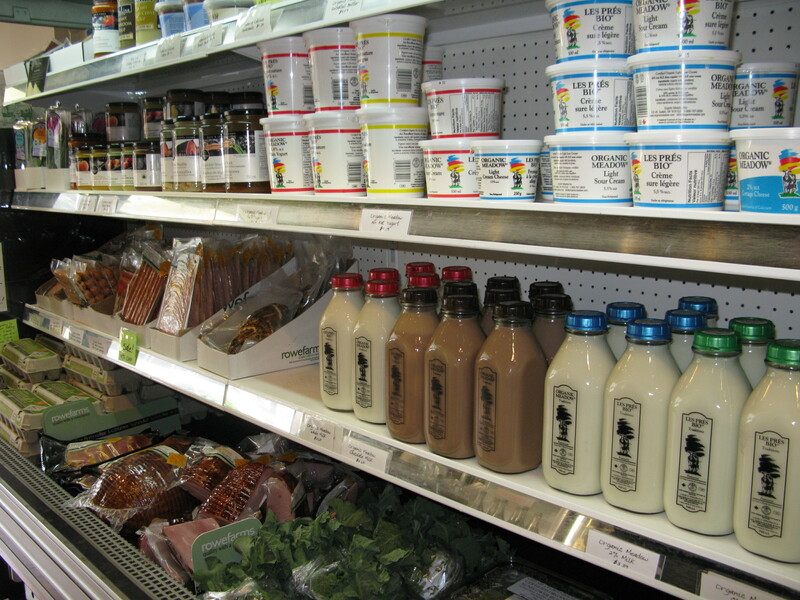 Green sprouts: The tiny but charming Barton Snacks is cheering up the south-east corner of Bathurst and Barton with espresso-based coffee drinks and premium products like ice cream from Maypole Dairy and healthy(-ish) potato chips prepared with avocado oil and reduced sodium. 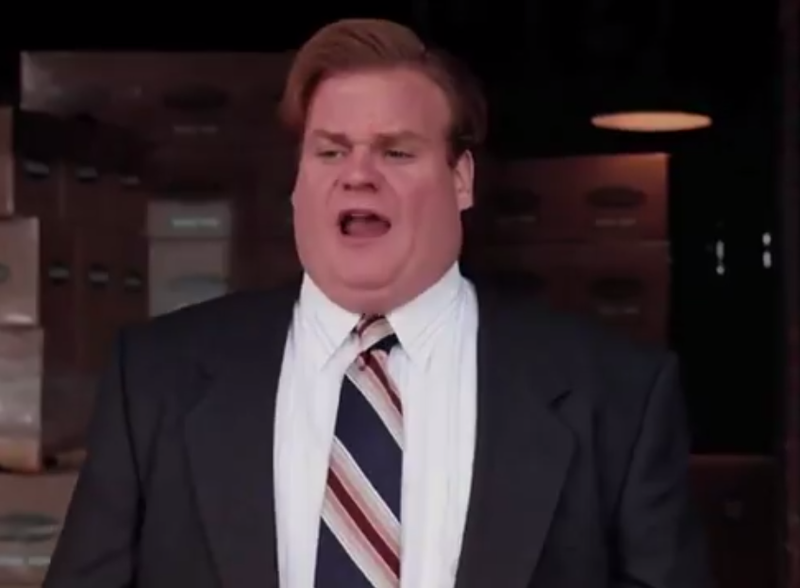 Manager Chris Sherwood tells us that he’ll also be serving hotdogs. 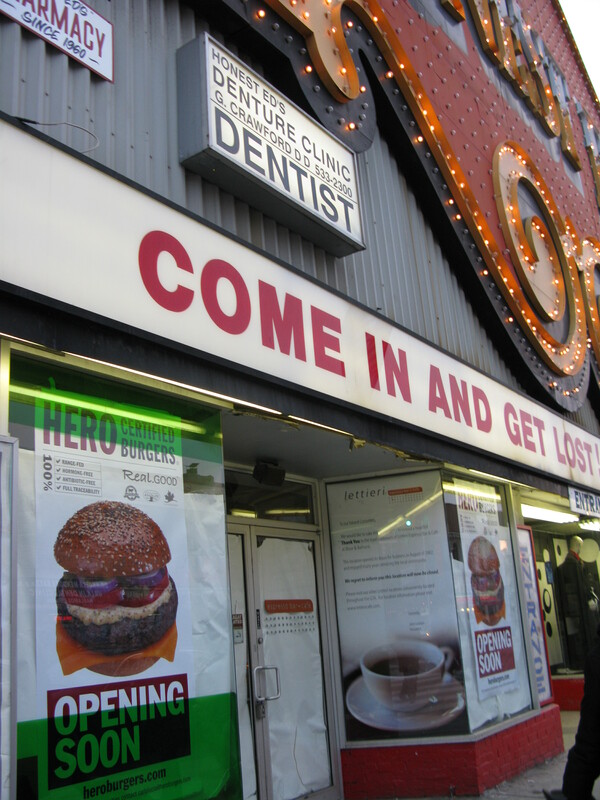 The Snack is open 8AM to 10PM Monday to Friday, and 11AM to 10PM Saturday and Sunday. Finally, a place to get indie coffee after 6PM in the Annex. And genuine Neapolitan pizza is coming to the Bloor-West Annex strip, albeit in the form of an Edmonton-based chain Famoso Pizzeria. 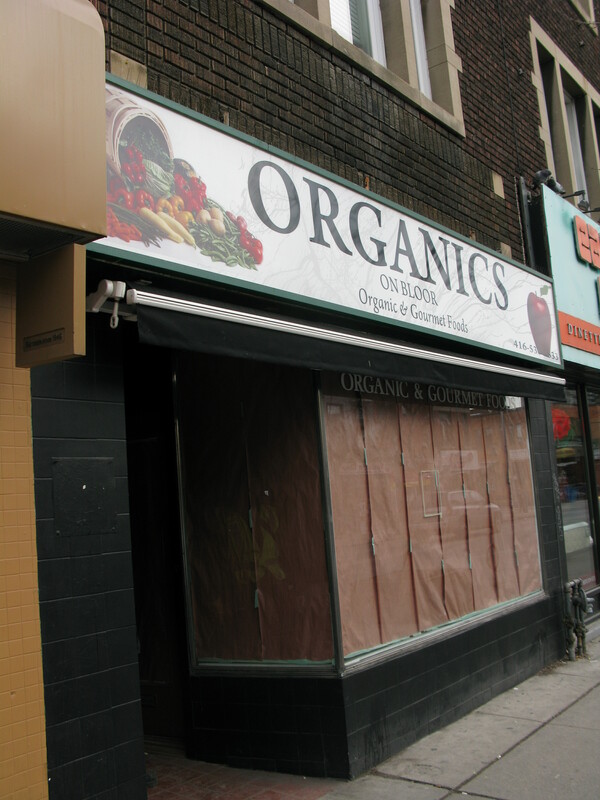 The owners expect to have the 386 Bloor Street location open by June 21, 2012. The previous tenant was the James Joyce Irish Pub. Busy weekend: We hope the rain holds off for the Portugal Day Parade and Picnic today. The parade starts at 11AM on Landsdowne at Bloor and then heads down to Dundas Street West for the live music and picnic in Trinity-Bellwoods Park. If it rains, the wonderful Ring Around the City reminds us that the Raw/Vegan Festival is going on all weekend indoors at 918 Bathurst Street, just north of Barton. The inaugural Junction Flea market is this Sunday June 10, starting at 9AM, on Dundas Street West, one block east of Keele. If this preview of The Vintage Cabin’s wares is in any way typical of the quality and prices of the offerings, this is a not-to-be missed event. 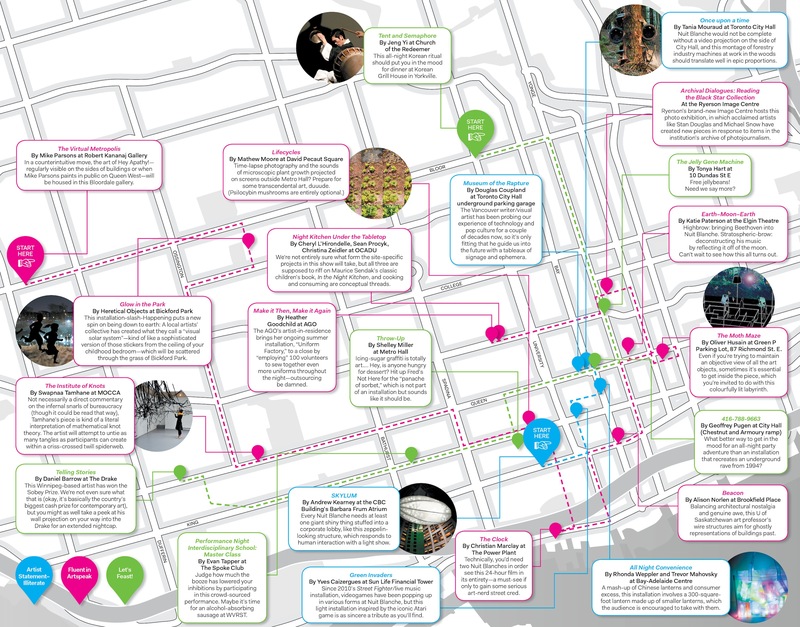 Then from 11AM to 6PM Sunday it’s the Annex Festival on Bloor. We’re sad this festival seems less Annex, more the same old travelling road show of vendors that you see over and over again at every Toronto street festivals. But we love the chance to walk on a car-free Bloor Street between Spadina and Bathurst once a year and enjoy the live music. 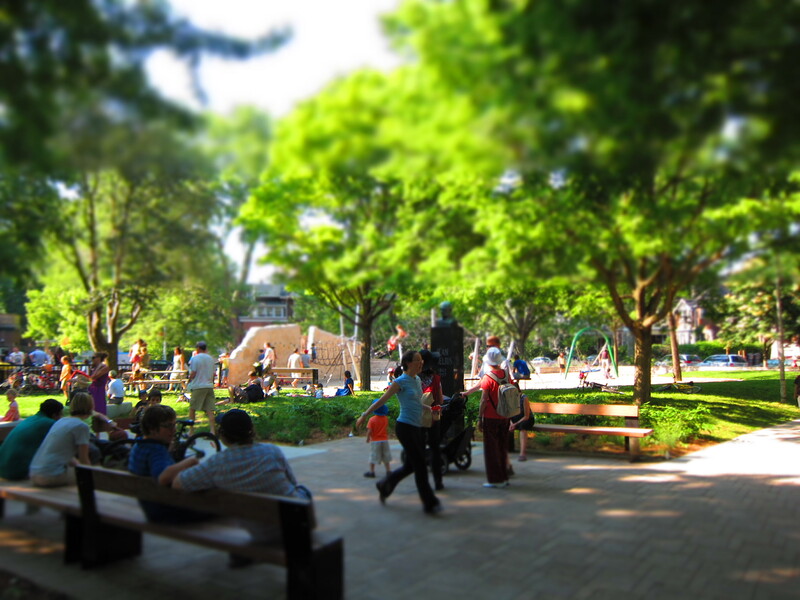 Then at 3:30PM Sunday, don’t forget to head over to the Jean Sibelius Square Park official re-opening. 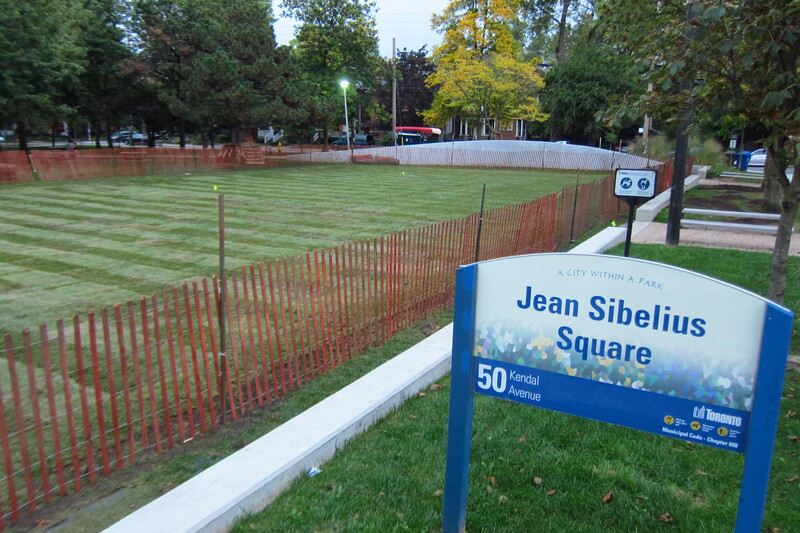 The renewed Jean Sibelius Square Park, 50 Kendal Avenue in the Annex. 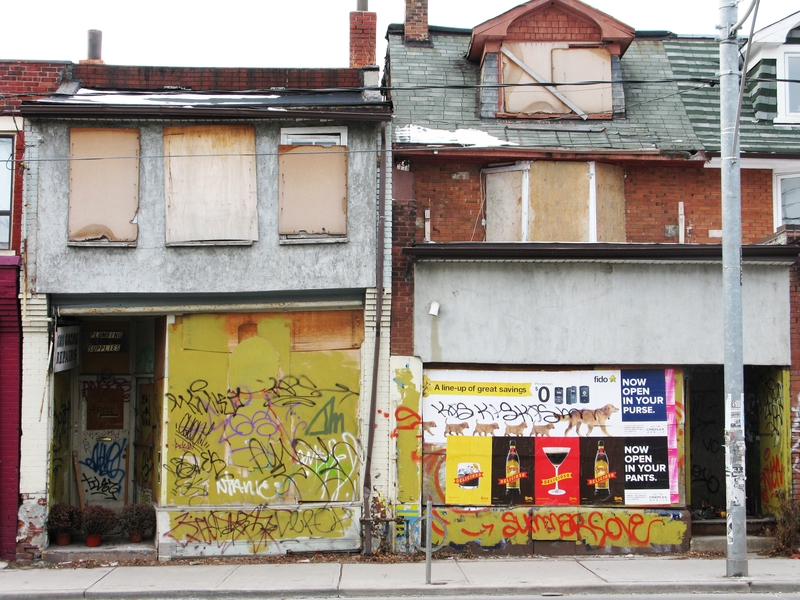 Good reads: YongeStreet proposes how Toronto can further densify without more condos in Right up your alley: Can laneway housing provide an antidote to our high-rise growth spurt. 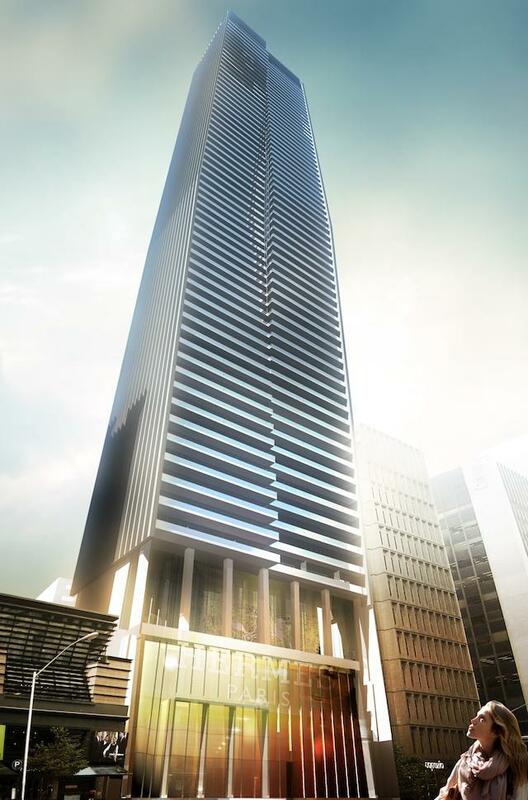 Toronto Life has a story about that 83 story condo, the tallest in Canada, that could be coming to the Holt Renfrew Centre on Bloor. 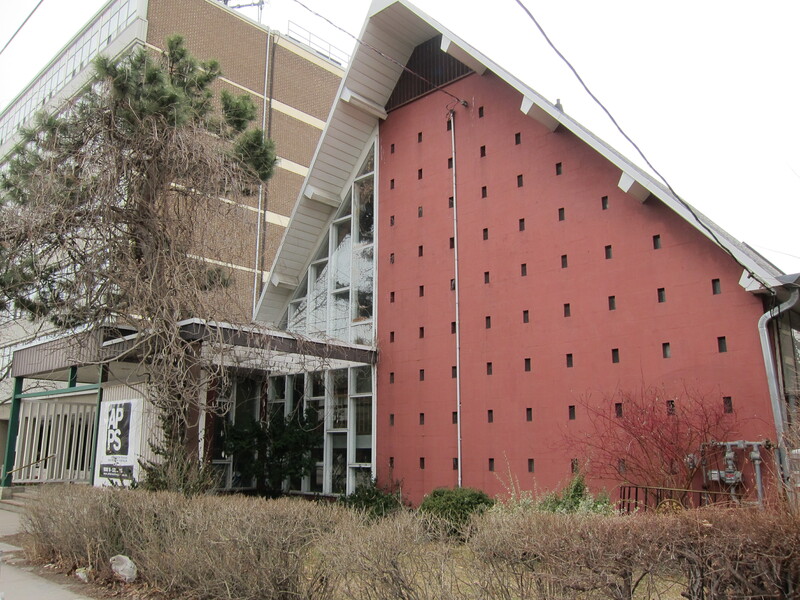 Closer to home, the massive condo development including a 40-storey glass condominium planned by the United Church for the Bloor Street United Church at Huron and Bloor has local residents and Councillor Vaughan concerned [The Varsity]. 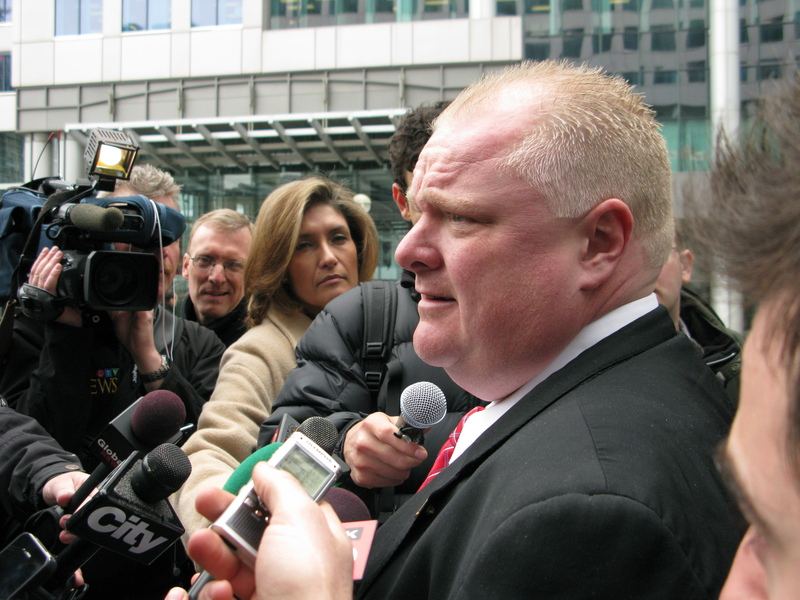 The Dupont Street cycle lanes are probably safe for now despite the plotting of Ward 17 Councilor and Rob Ford ally Cesar Palacio to get rid of them [openfile]. 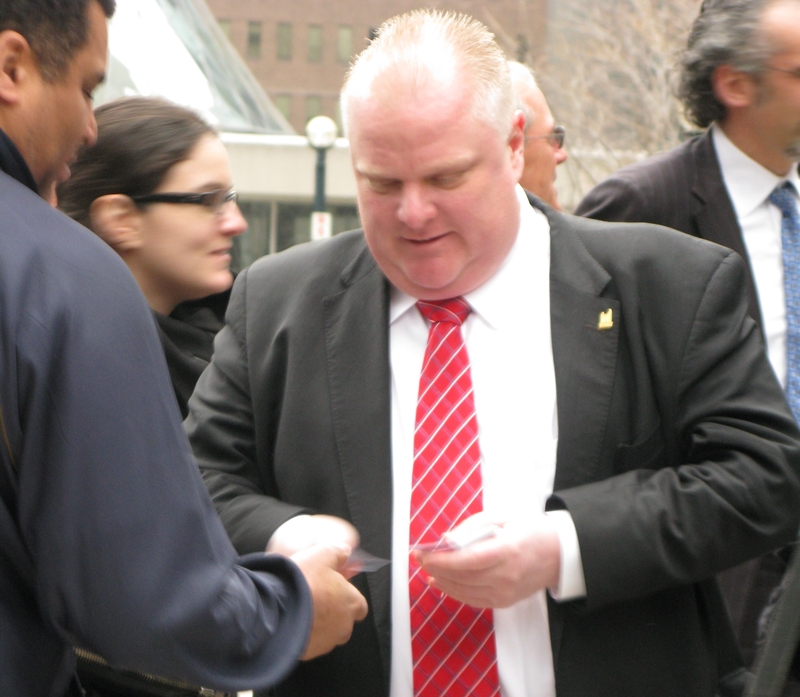 Ring Around the City is passing on a warning from 14 Division about a hot water scam in the neighbourhood. Two men already face charges. 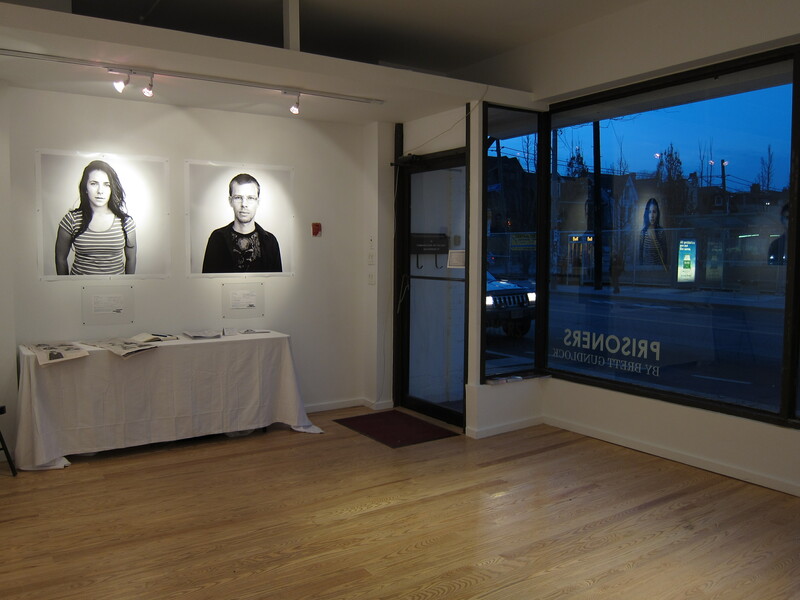 By West Annex News | Last month while reviewing the John Cadiz show at Ideasincorporated gallery, we commented upon the exciting mix of galleries, indie coffee houses, shops and restaurants suddenly appearing on Bathurst Street south of Dupont. Since then we have watched while several more building on this rapidly gentrifying strip have been transformed. None has been more intriguing than 1042 Bathurst Street. Following the departure a few years ago of Apollo Volvo Specialist mechanics in the rear and Das Autopro, a European auto accessories shop in the retail space in the front, this double-wide space had been occupied by a number of short-lived tenants. By mid-2010 the space was empty, and stayed that way for some time. 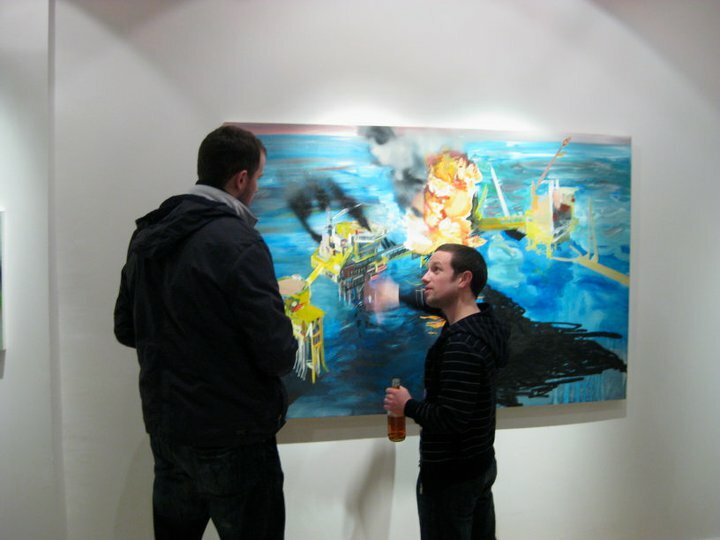 Then in the late in 2010, interesting things began to happen. First the space was stripped down to white walls and hardwood flooring. 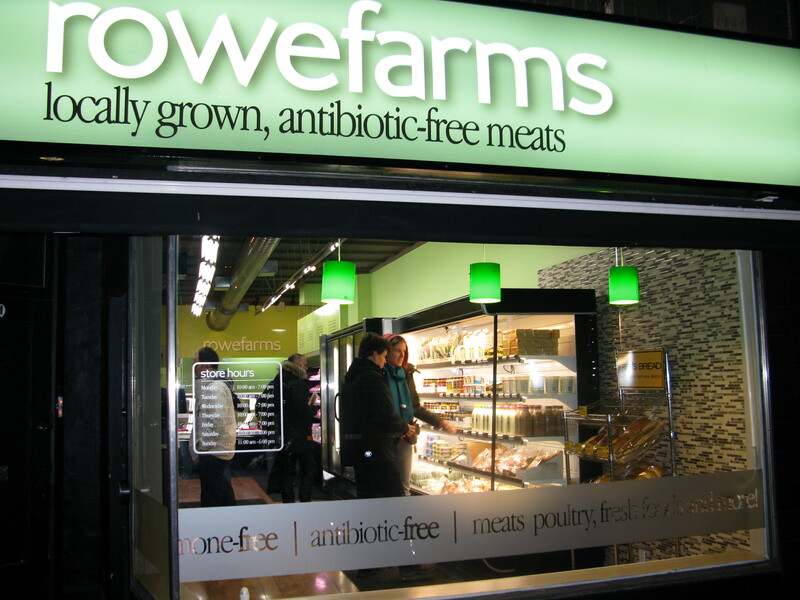 Some time later a black curtain appeared across the entire width of the back of the store, and then stark fluorescent tubes were installed on the floor and a wall. 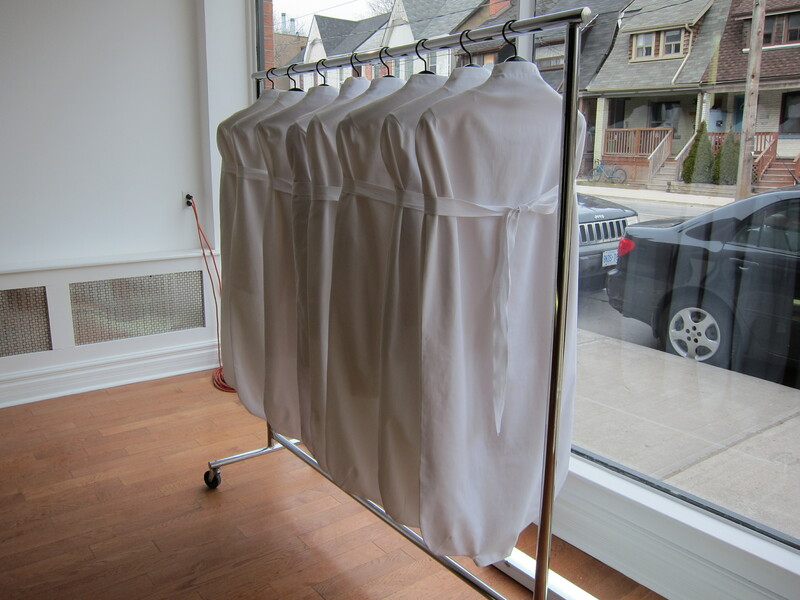 Finally a clothing rack arrived in one window, from which hung beautifully tailored white shirts. But were they shirts? On closer inspection, the shirt tails were sewn together at the bottom, and straps wrapped around them. Were these stylized strait jackets? 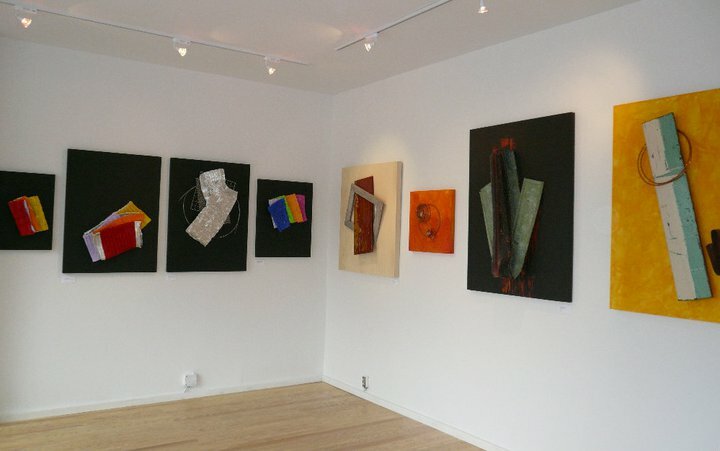 Was this a gallery? An art installation? 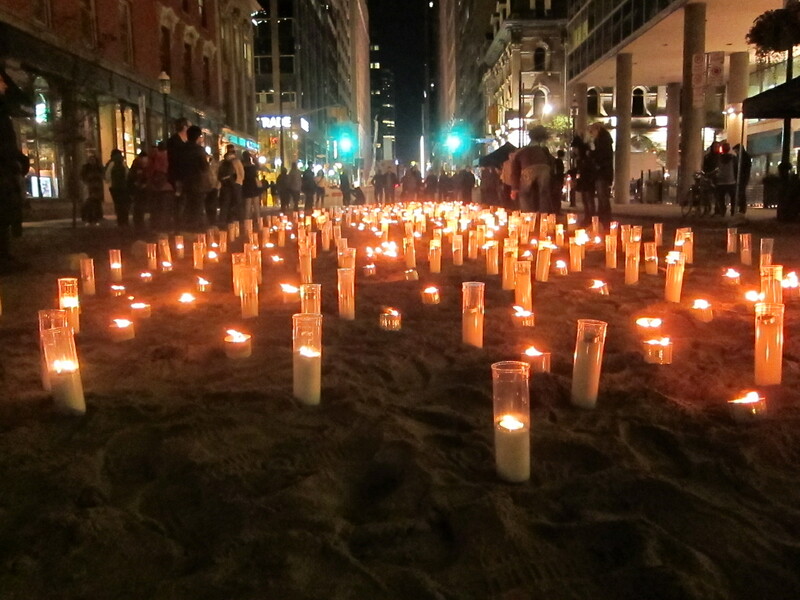 A performance space? 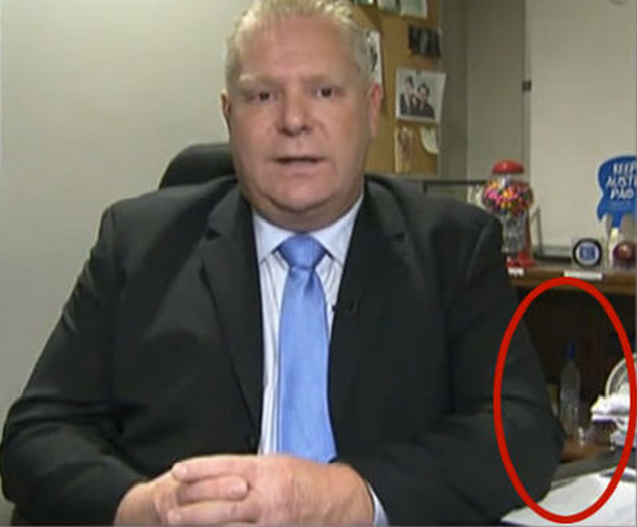 Then cryptic information appeared in small letters in the bottom left corner of the front window. A name, an email address, and a website, for about Design Corp. We visited the website, which featured moody, enigmatic videos which only deepened the mystery. To add to the intrigue, the front door were always locked, no matter the time of day we went by. That is, until last Saturday, when we tried the door, and it opened. Inside we met the charming Dean Hutchinson and Yunchieh Chang, the fashion designers and principals behind about Design Corp, who ushered us into their spare, elegant, and now-opened shop. Yunchieh Chang and Dean Hutchinson of about design corp.
Hutchinson is returning to Toronto after many years in the San Francisco fashion scene. A Canadian, he headed to California immediately upon his graduation from the University of Saskatoon Fine Arts program to learn the fashion business. He quickly built a following for the strong, beautiful architecture of his designs. 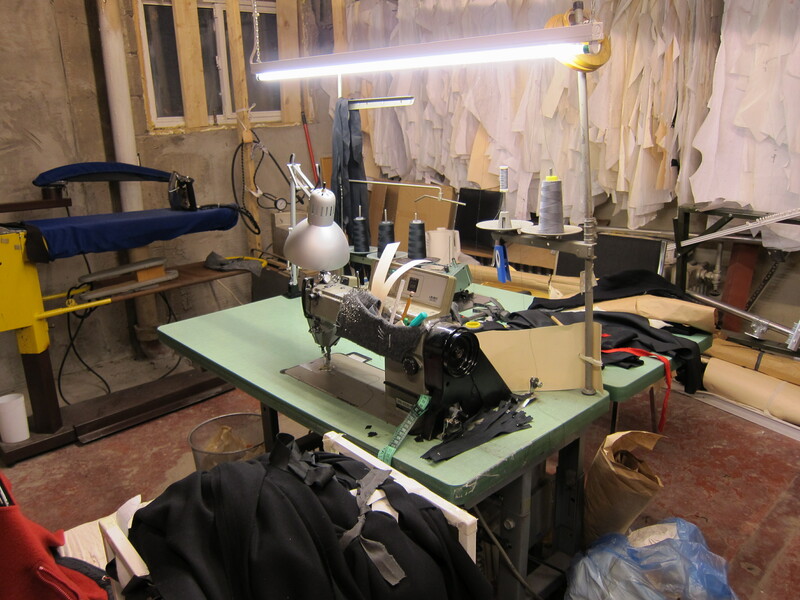 In the late 1990’s he established Dean Hutchinson (Design) Inc. where fashion designed and manufactured in Toronto was sold at his San Francisco retail stores. In California, Hutchinson met Cheng, an American born in Singapore and a winner of a prestigious Council of Fashion Designers of America fashion design scholarship. About Design Corp. is the product of their collaboration. 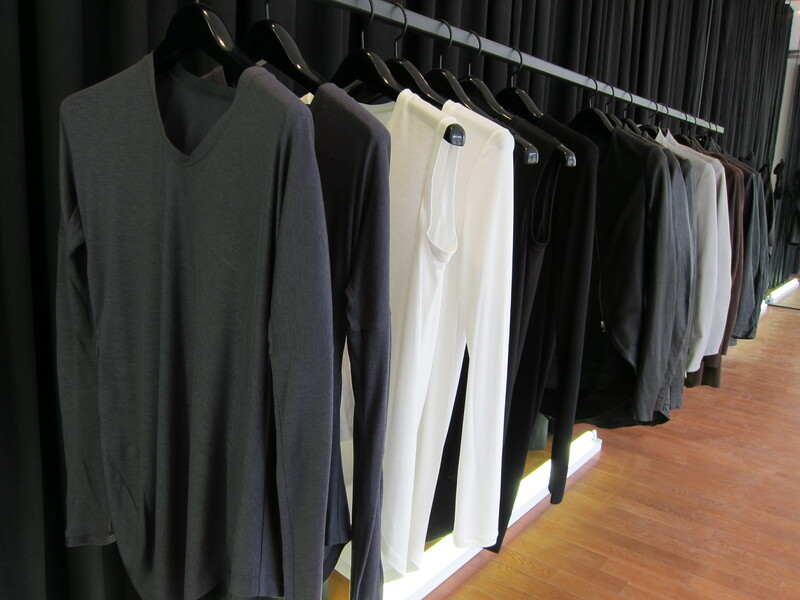 Their Bathurst Street atelier contains immaculately constructed classic wardrobe pieces in black, white and gray, together with asymmetrically designed jackets in fabric and leather. The leather is luxurious and buttery soft; it drapes like fabric. On some pieces exposed zippers add an edge to the feminine designs. “New idea need old buildings” Jane Jacobs said. 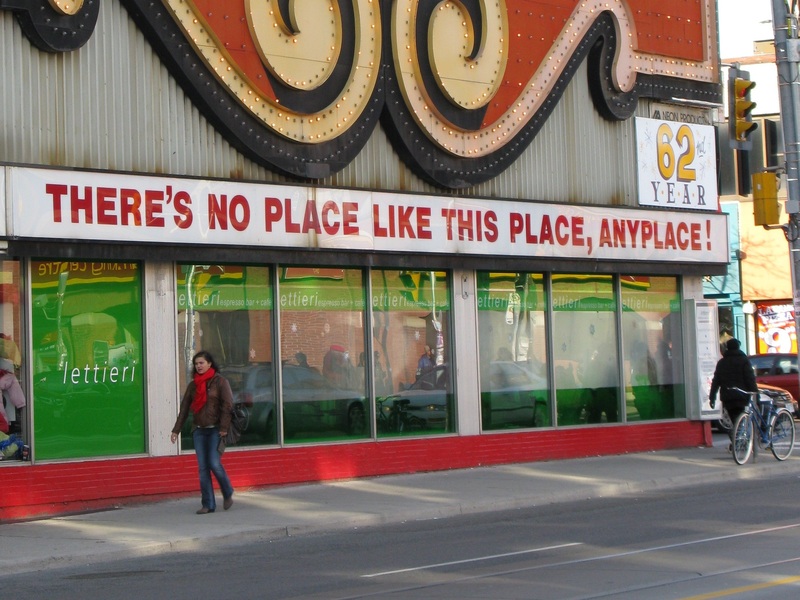 And about Design Corp. and Bathurst Street exemplify this maxim. The still relatively low rents on the street allow Hutchinson and Chang to locate their design studio, manufacturing facility, and showroom all at in the same building. Chang and Hutchinson were kind enough to part the black drapes that so dramatically frame their showroom, and give us a behind-the-scenes tour. The design and manufacturing area is down the stairs from the showroom. It’s an exciting space bursting with creativity, with paper patterns lining the walls and works in progress partially assembled on dressmaker dummies and spread out on large tables. About is the latest of a number of new shops, galleries and cafes which have been garnering rave reviews from the media, like Madeleines, Cherry Pie and Ice Cream, Rapido, Burnett, Java Mama, ideasincorporated, Barbara Edwards Contemporary, Ewanika, and Scoop and Bean, and which have joined with neighbourhood stalwarts like Annapurna Vegetarian, La Parette Gallery and the unspoiled vintage diners Apollo 11 and Vesta Lunch to form a vibrant new neighbourhood. For lack of a better name, we called the neighbourhood the upper West Annex in our last article. 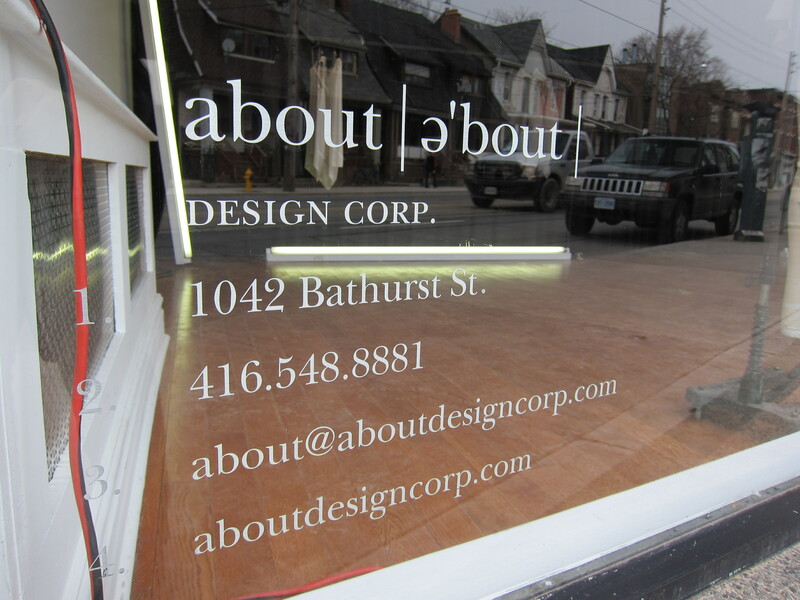 Since then we’ve heard that local merchants–who are banding together and hope to form a business improvement area–are branding the area “Bathurst-Dupont Village”. We’re glad to see such efforts towards a BIA. The stretches of interesting new shops on Bathurst are still broken up by tough, gritty sections that discourage pedestrian traffic. 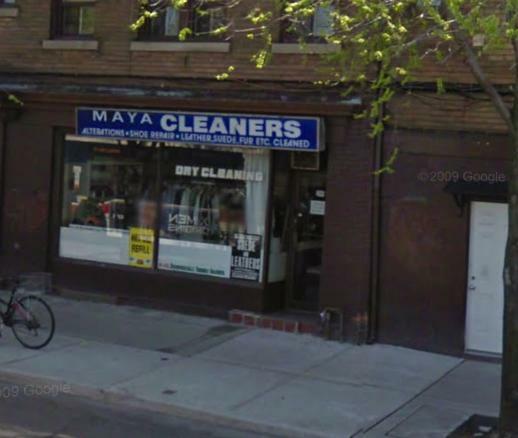 Merchants and their landlords have to work together to try to steward the gentle gentrification of the street, to entice shoppers to travel up the street from Bloor. 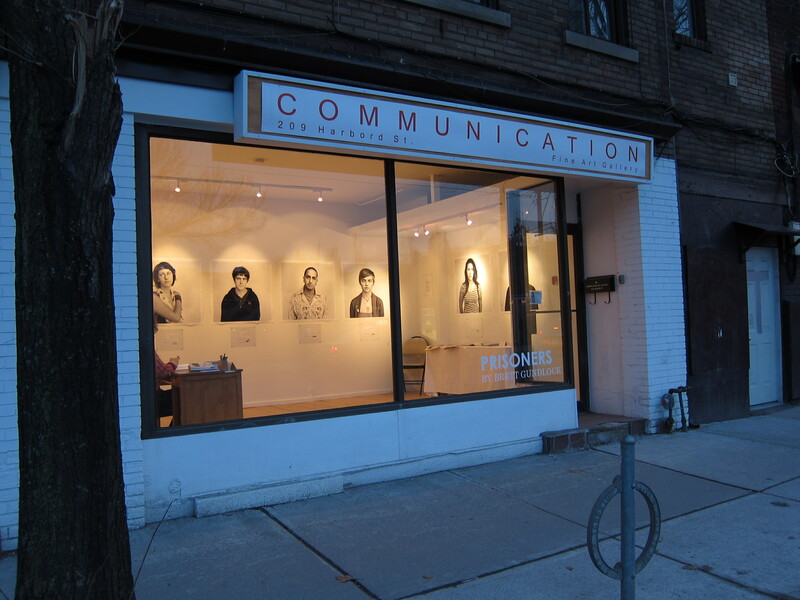 But care must be taken that the area does not undergo explosive growth like Ossington Avenue experienced, where the pioneers of the gentrification are quickly priced out of the mix by rapidly rising commercial rents. About are welcome new members of the vanguard who are transforming Bathurst street for the better. We’d like to see them stick around. Postscript: Before ending our interview with Hutchinson and Chang, we asked about the stylized strait jackets that had so intrigued us for months. Hutchinson laughed. Neither strait jackets nor art installation: those perplexing white garments are about’s custom-made garment bags. 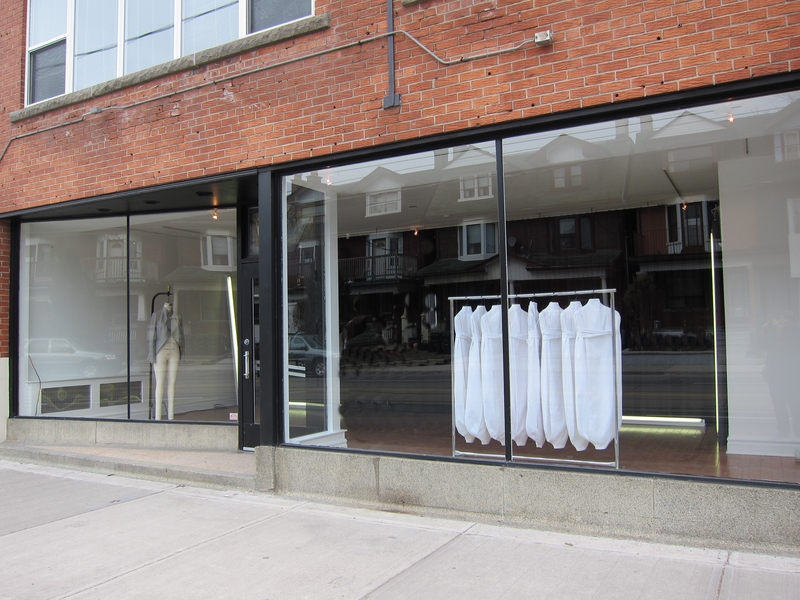 Read Karen van Hahn’s Bathurst and Dupont is the newest style mecca in thestar.com, and Bert Archer’s Bathurst Street’s gorgeous bones in YongeStreet. 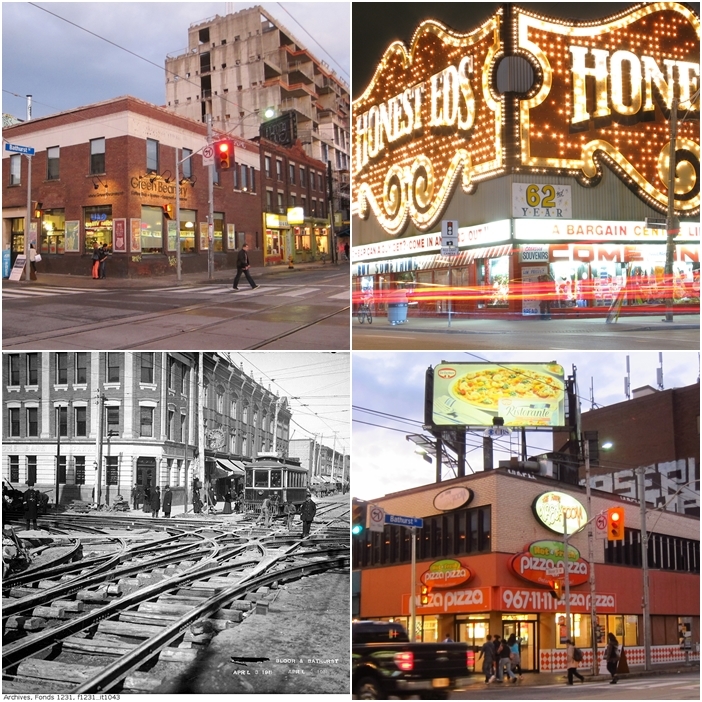 In Arrivals & Departures we document the changes in the commercial/retails strips of the West Annex on Bloor, Bathurst, and Dupont Streets. 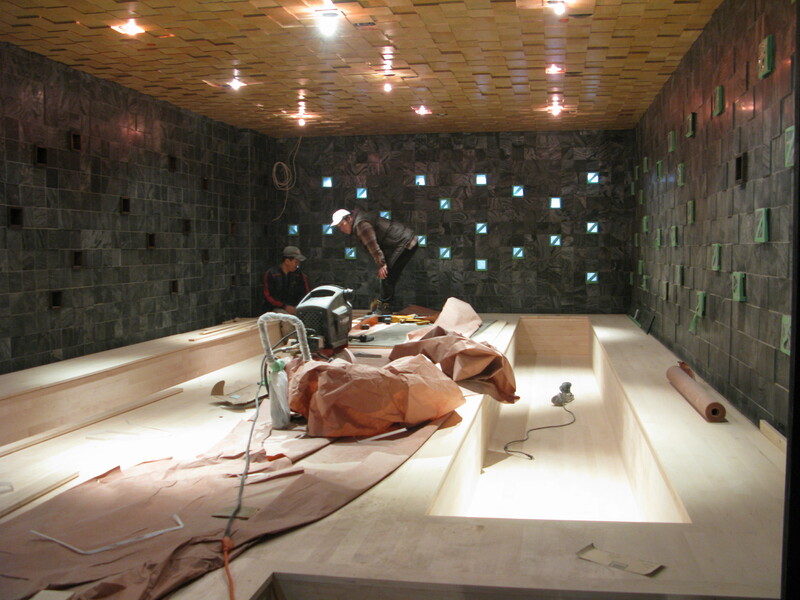 The unfinished but already jewel box-like tatami room at the front of Guu SakaBar | 559 Bloor Street West. 20 March 2011, 5:20PM update from our Twitter feed: Walked by @GuuSakabar 15 minutes ago and they are indeed finally open, and for probably the only time in their history, there isn’t a line-up–yet. By West Annex News | Chowhound first voiced the rumours in July of 2010. By the fall several media outlets confirmed them: Guu Izakaya, the insanely successful Japanese-style pub at 398 Church Street in Toronto is opening a second location at 559 Bloor Street West, in what is now the most eagerly anticipated debut on the Bloor-West Annex strip. 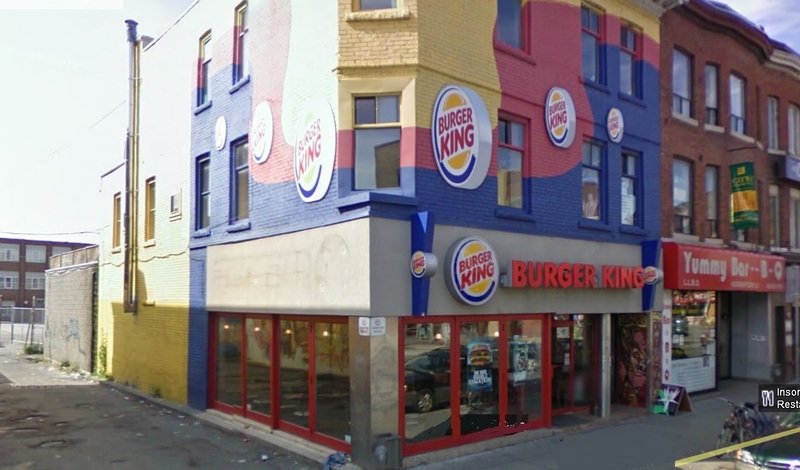 The space, just east of Bathurst, was previously occupied by Burger King, and before that, CFNY Radio’s street-front studio. 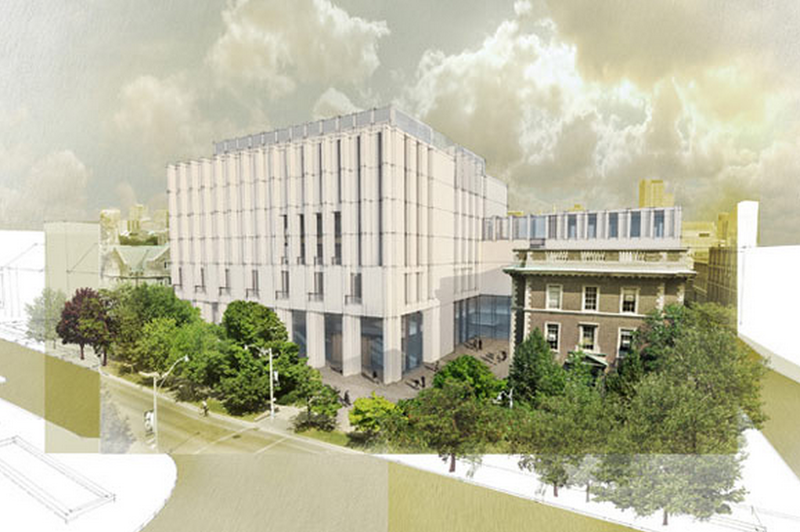 Construction has been ongoing on for many months now, during which time various sites have speculated on the date the Annex Guu will open its doors. 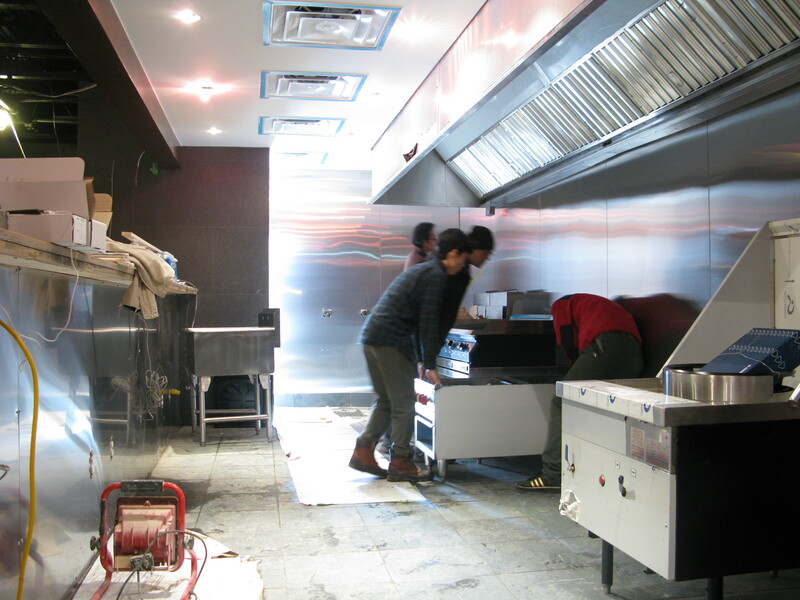 We contacted Hyunsoo Kim, the general manager at Guu Izakaya, who generously invited us in to see the state of the renovations on February 17, 2011. 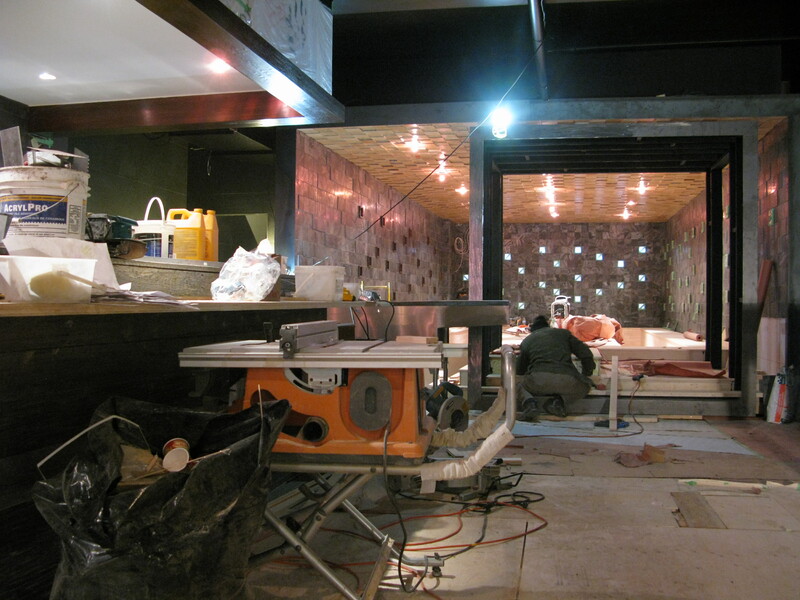 Although still very much a construction site, the restaurant interior is taking shape. The sushi bar to the left and the tatami room up front. Entering the restaurant from the back kitchen entrance, we were immediately attracted to the beautiful tatami room up front, which although only partially finished, already glows like an exquisite jewel box. The many small square port hole-style windows, familiar from the Church Street location, allow twinkling light into the raw quartz-tiled room, and offer glimpses out to Bloor Street. The hardwood floors and textured wooden ceiling tiles give the room a warm glow. 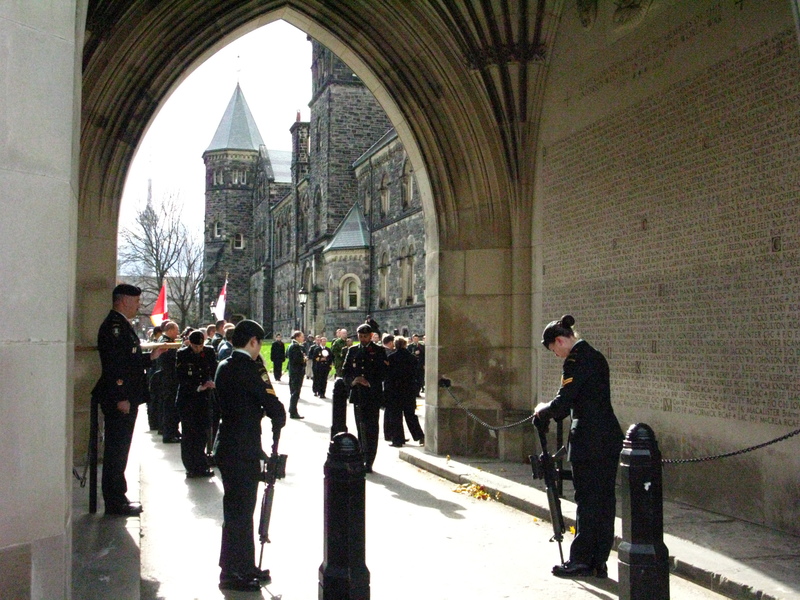 The entranceway off Bloor is a long hall that runs adjacent to the east wall of the tatami room. It has been thoughtfully laid out to provide a large area where patrons can wait in line, sheltered from the outdoors, but separated by a wall from those already seated in the restaurant. Given Guu’s no-reservation policy, admittedly designed to try to keep out demographic undersirables like aging boomers, one suspects that the line-up will continue right out the door and down the laneway that lies to the immediate east of Guu’s building. Right behind the tatami room on the west wall is the sushi bar, finished in rough grey barn-board. Behind the bar in the south-west corner of the building is an open kitchen, already gleaming with its stainless steel walls, and appliances that were just being delivered during out visit. The main dining room is directly opposite the open kitchen, occupying the south-east corner of the building. It’s now barely roughed-in, and is packed with construction materials and machinery. 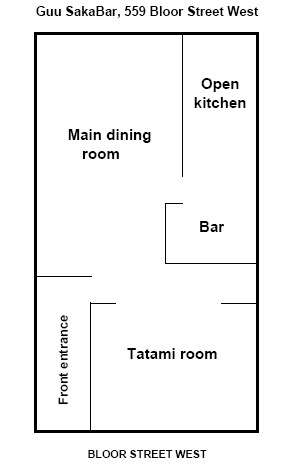 We prepared the sketch, left, of the basic layout of Guu SakaBar after our visit. Although extremely busy supervising construction and taking delivery of appliances and materials, both General Manager Hyunsoo Kim and manager of the Annex location Natsuhiko Sugimoto were generous with their time answering our questions during the visit. 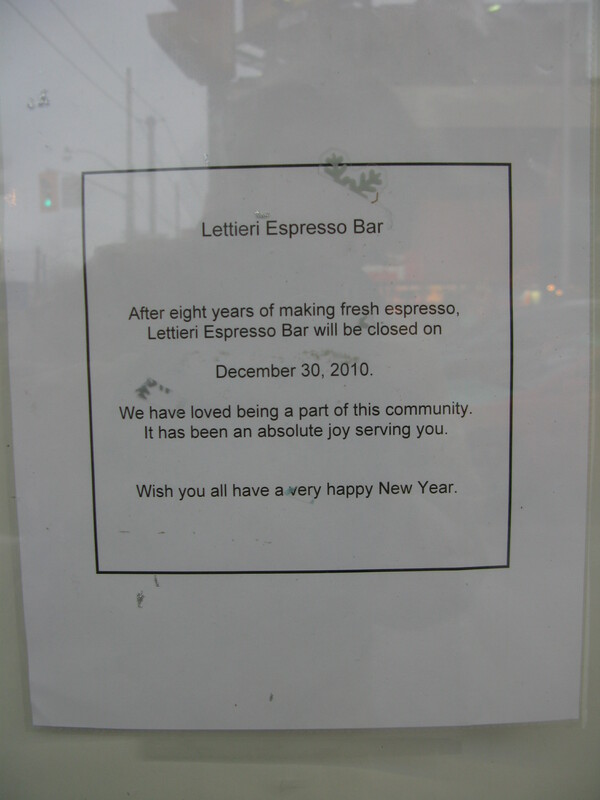 They said the opening is now expected in mid early March 2011. Asked about the menu, Kim said some of the dishes from Church Street will be available in the Annex location, but that they planned “many surprises”, details of which Kim told us, with a smile, that he is saving for the opening. It was only after we left the premise and inspected the business card that Sugimoto gave us that we noticed that the Annex location is not described as an izakaya restaurant–which in Japan means a cheap and cheerful after-work pub for drinking and snacking while waiting out the worst of rush-hour traffic–but a saka bar. Although the terms are sometimes used interchangeably, in Tokyo at least, saka bars are often a step up in sophistication; more cocktails-and-tapas than pub. 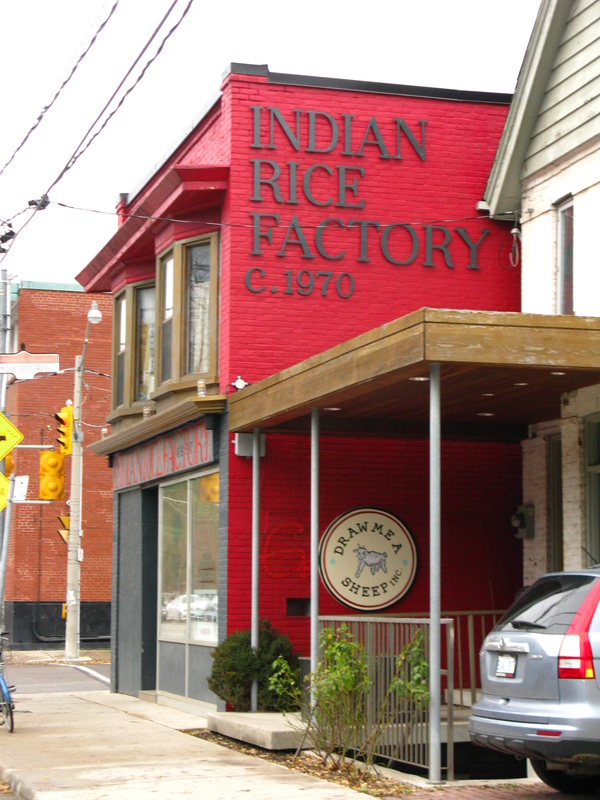 The first Toronto location of this popular Vancouver franchise has polarized Toronto diners. 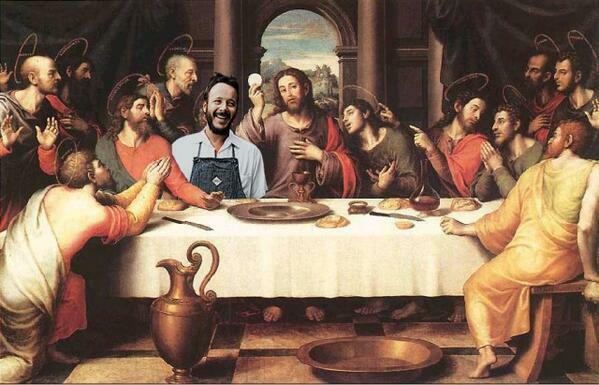 The Church Street spot ranks number 3 on Joanne Kates’ current top ten restaurants in Toronto and number 2 on NOW’s most overrated restaurants. But a careful review of the comments section of most on-line reviews generally shows raves for the imaginative and well-executed food, but loathing for line-ups for seats of up to two hours. This second location should alleviate the line ups somewhat. And line-ups are nothing for habitués of the Bloor-West Annex strip, long-practiced in the art of the line thanks to venues like Lee’s Palace, the Brunswick House, New Generation Sushi and Sushi on Bloor. Guu SakaBar should be a perfect fit for a neighbourhood already obsessed with Japanese food and willing to put in some time to get it. 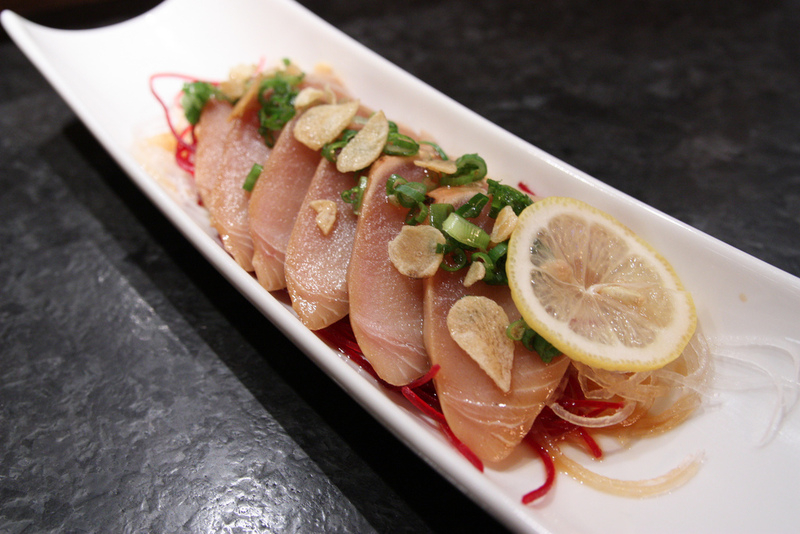 See Sifu Renka’s photoset of the food and decor of Guu Izakaya’s Church Street location on Flickr. In Arrivals & Departures we document the changes in the commercial/retails strips of the West Annex on Bloor, Bathurst, and Dupont Streets, and think about these changes in the context of Jane Jacobs’ observation that popularity on retail strips can lead to commercial monocultures, and of Max Fawcett’s thesis that the Annex is un-gentrifying. 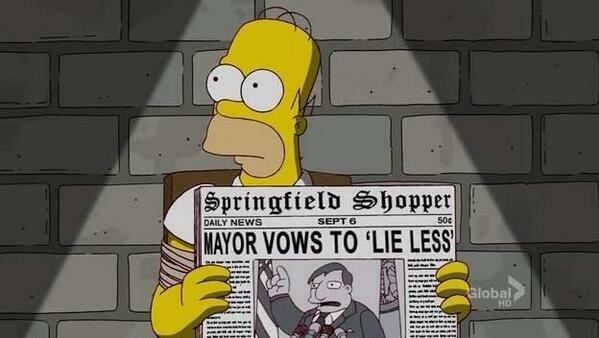 By West Annex News | Finally! The wait is over. 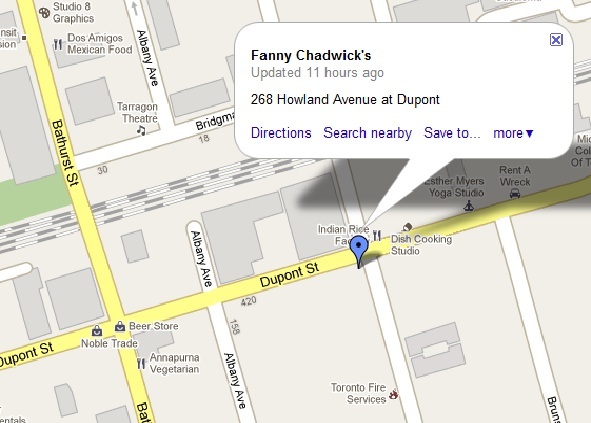 Fanny Chadwick’s at Howland and Dupont opened its doors the evening of Wednesday, February 16, 2011. 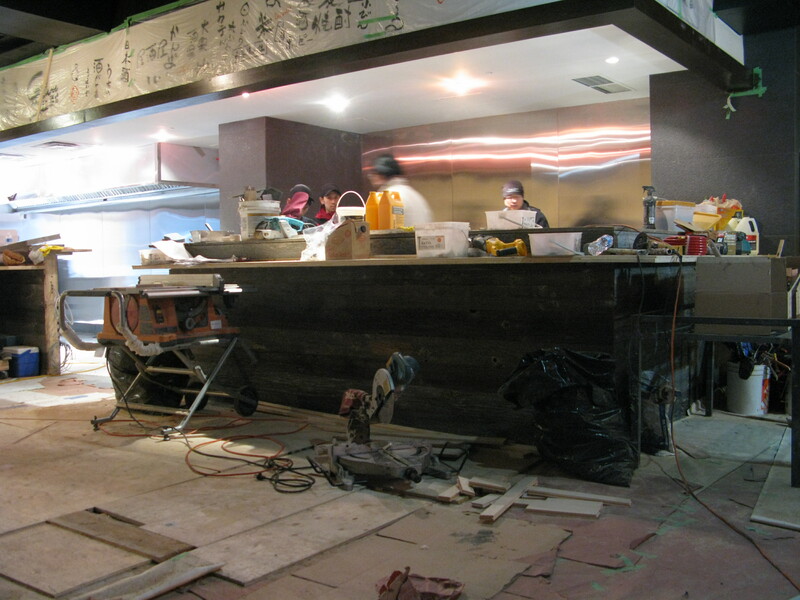 We were given a look inside on Thursday, February 17th, just after the restaurant’s soft opening the night before. The transformation from the space’s last incarnation–AAA Chinese–is remarkable. There are large windows on the north, east and west sides of the restaurant, which allow natural light to flood into the space. Inside is spacious, comfortable, and contemporary. The medium-brown wooden floors gleam. Comfy booths upholstered with bright, modern, geometric fabric line the walls, and vintage bar stools, upholstered in red leather–restored originals dating back from the days the space was Angelo’s Diner– provide seating around the L-shaped bar. Sadly, we can’t show you the photographs we took during of our look inside the restaurant; part-owner Sarah Baxter wanted prior approval before we posted them, approval which she ultimately would not give. So we can only show you this mobile phone photo that @foodie411 (aka Joel Solish) apparently snapped off on opening night and shared on twitpic. Baxter wouldn’t show us her menu either (although we found it later, also posted by Solish) as she said it was still evolving based on the feedback received during this week’s soft opening. 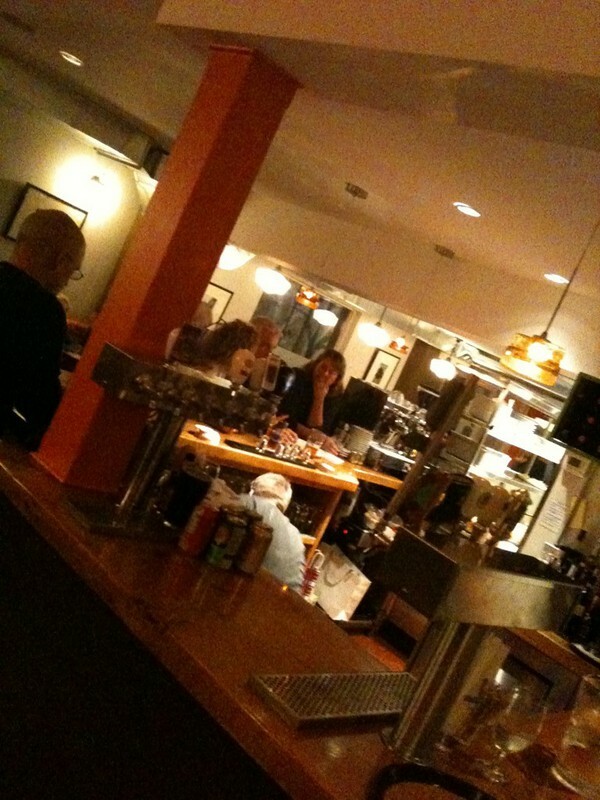 She did share that the menu’s focus will be on seasonal comfort food, sourced locally where possible. 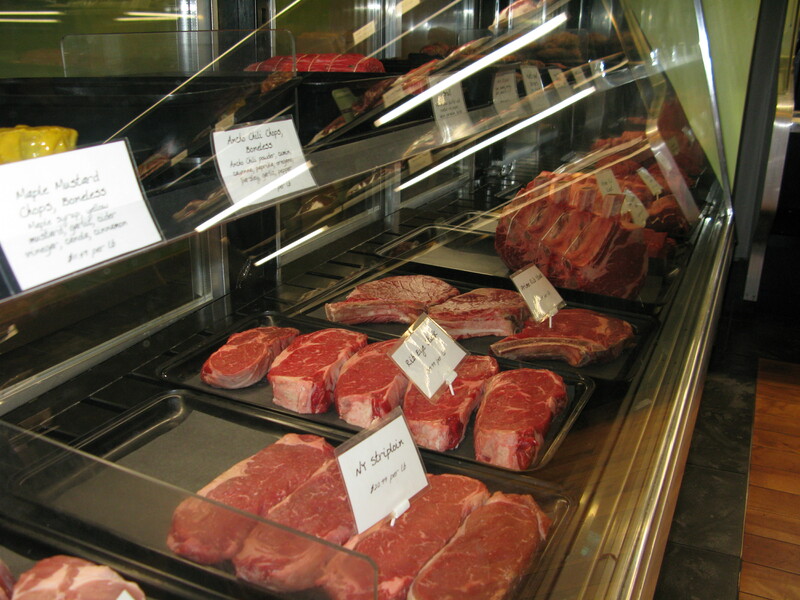 The meat will be from Rowe Farms, the beers from Ontario and Quebec, and the wine international. An enthusiastic review of the food served the night of the soft opening night can be found on Solish’s Community Foodist website, together with more photographs of various dishes served that night. 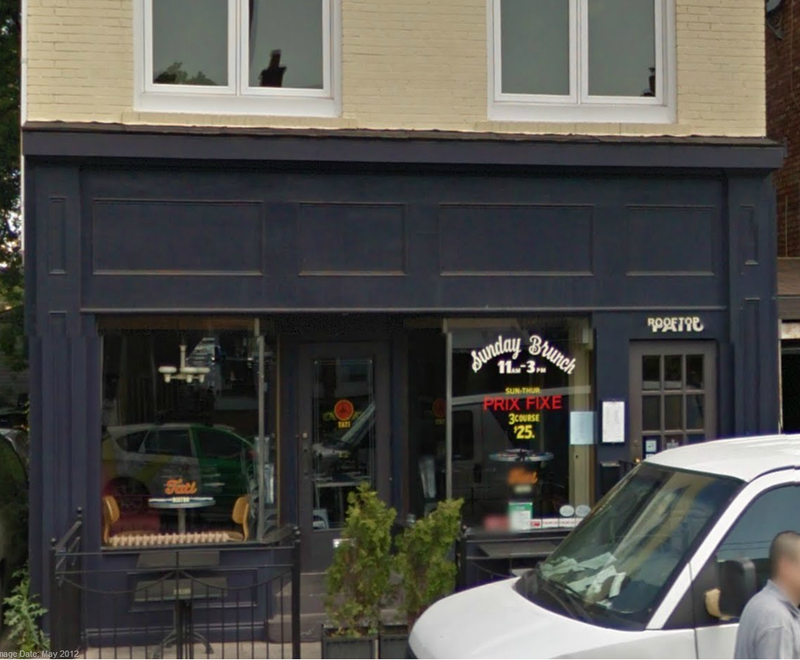 As we understand it, Fanny’s will be open for dinner this week, brunch on the weekend, and then open full hours sometime next week. The Fanny Chadwick’s website is still under construction but gives this phone number–416.944.1606–and an email address for information: info@fannychadwicks.com. Regular updates are appearing on Fanny’s Twitter account, @FannyChadwicks. 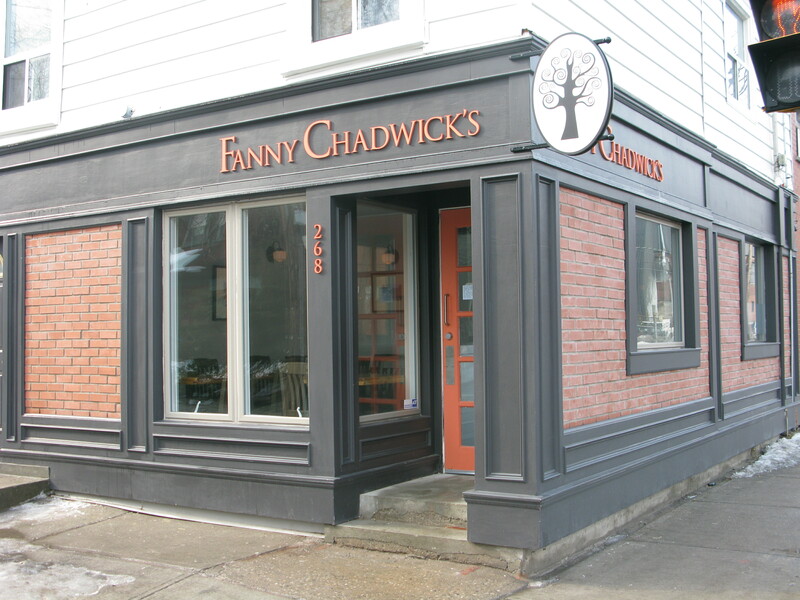 The restaurant is named after Fanny Chadwick, an illustrious former resident of 111 Howland Avenue. According to Jack Batten in The Annex: The Story of a Toronto Neighbourhood, Fanny was born on January 10, 1873, and moved to 111 Howland Avenue at age 11 when her father, a successful senior partner with a prestigious 19th century Toronto law firm, built the enormous home opposite the See House beside St. Alban’s the Martyr Cathedral.The Chadwicks were Anglicans and committed supporters of the then partially constructed Cathedral. A gifted writer and actress, Fanny prolifically wrote, produced, and starred in plays which she presented in the living room of the spacious family home, to rave reviews from audiences that included members of Toronto’s working press. Fanny’s output dropped off after her marriage in 1898 and the birth of her son in 1900. 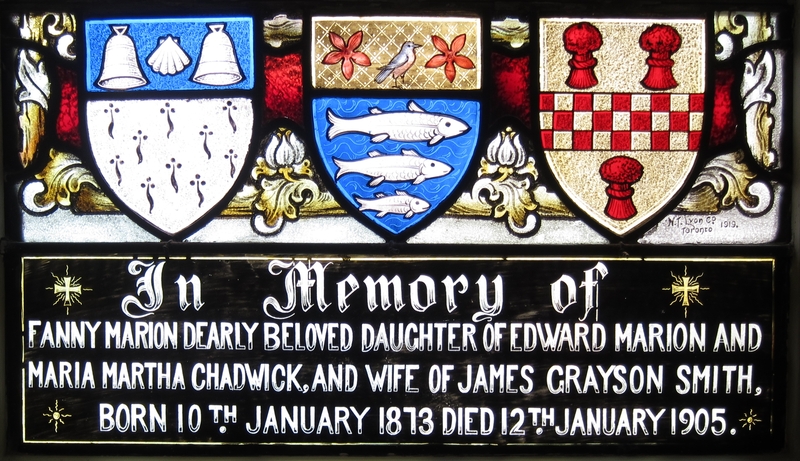 She died in 1905 at the age of 32. 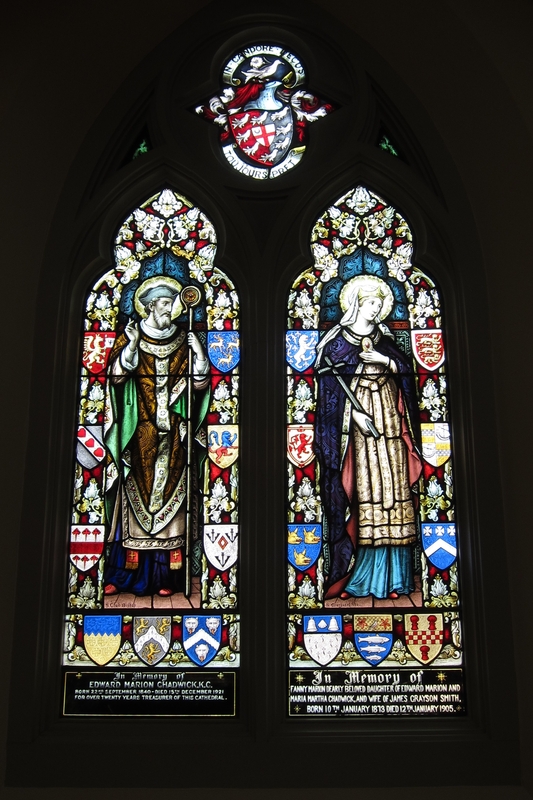 A stained-glass window in the Cathedral of St. Alban the Martyr at 100 Howland Avenue–across the street from the Chadwick home–commemorates her, donated by her heart-broken father. 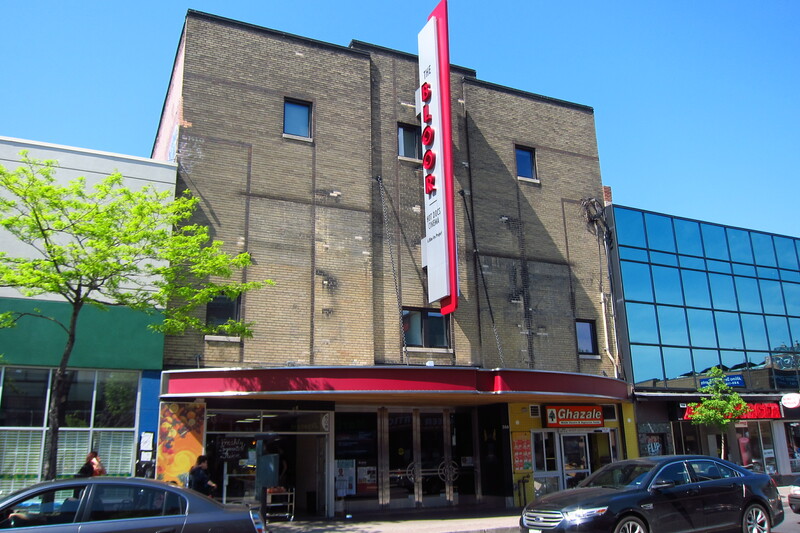 Fanny Chadwick’s restaurant is yet another sign that the upper West Annex is transforming itself, and far outpacing the Bloor Street strip to the south for the number of interesting shops, cafes, galleries and restaurant that are opening. 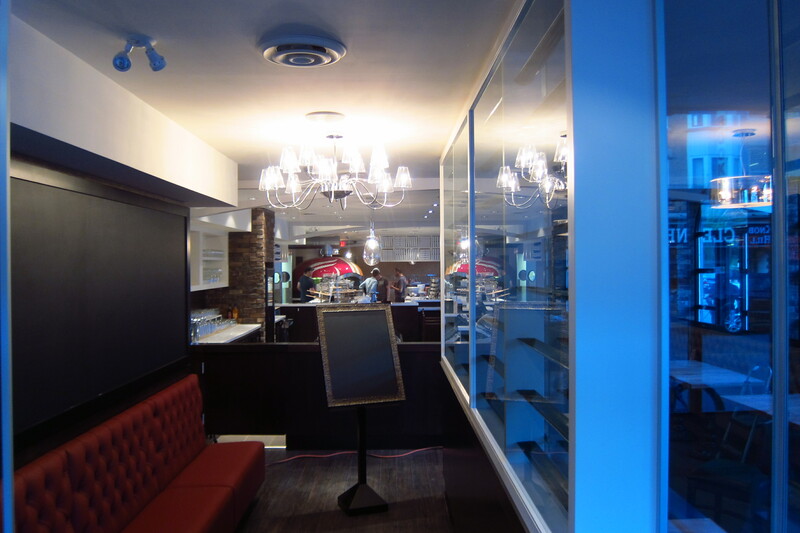 Bert Archer, “Venerable Dupont diner gets $250,000 overhaul, transforms into Fanny Chadwick’s”, YongeStreet. Jack Batten,The Annex: The Story of a Toronto Neighbourhood, 2004, Erin, Boston Mills Press. WestAnnexNews As we have a chef & restaurant owner in our family, we know it’s not fair to review restaurants until they’ve had a few months to sort out. So we had no intention of mentioning our meal @FannyChadwicks tonight before the Tarragon Theatre. But it was superb – food & service. The seared rainbow trout @FannyChadwicks is incredibly moist & flavourful & the portion size was generous (for the fish and the slice of apple pie). 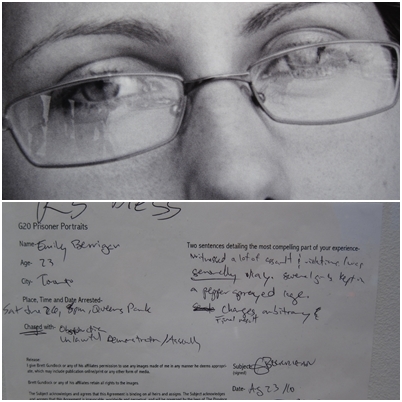 *20 February 2011: edited this post to add Fanny Chadwick’s phone number, now posted on their website along with the restaurant hours. 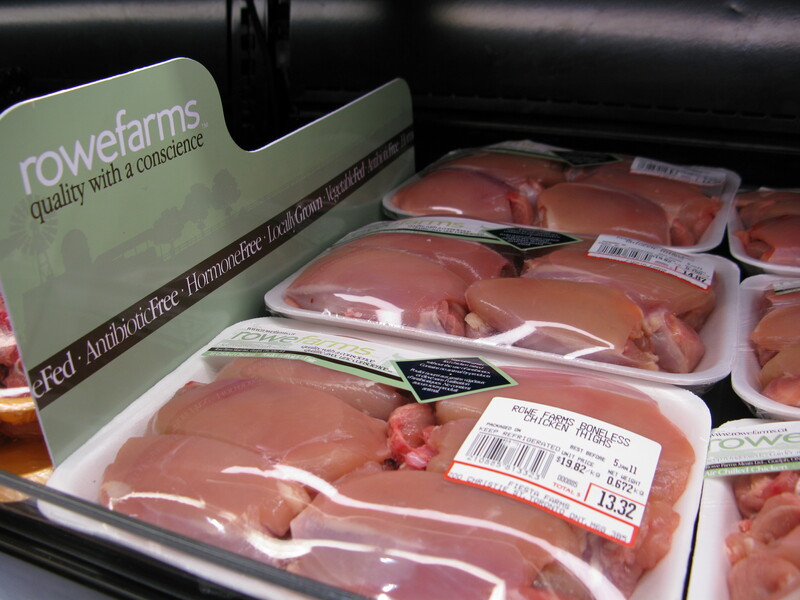 *19 February 2011: this post was edited to add the photograph by @foodie411/Joel Solish. 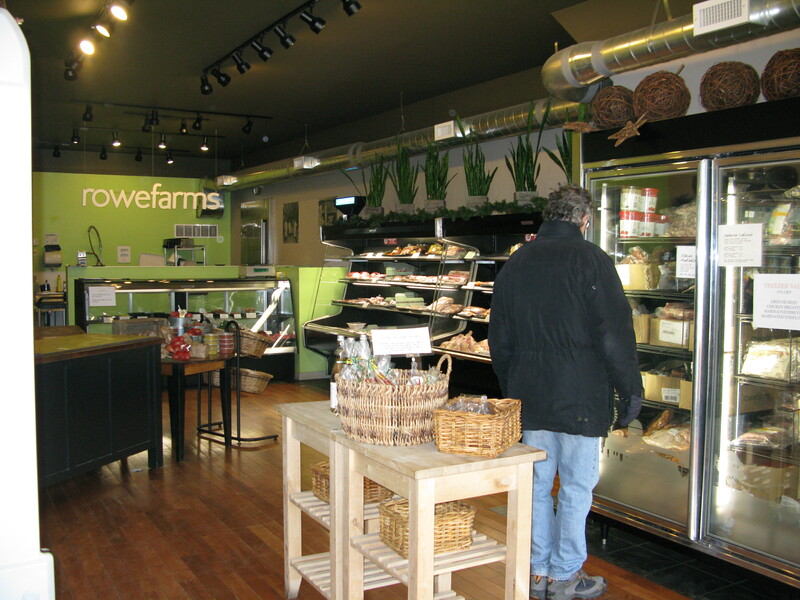 Visit his Community Foodist website.